Did someone say “Working Class?” I’ll drink to that! I love Spring. A lot. As a Minnesota girl this season would start to sneak a peak sometime at the end of April, and while we waited for a few flurries to subside, there would always be that one morning you could hear the birds chirp before you actually opened your eyes. It is the untapped current of energy, joy, and happiness in the unfolding of new, unworn air, sky and sun. It’s like Easter, but without the need to go to church or on a hunt to find your upcoming week’s leftover lunch that will be sans cake. 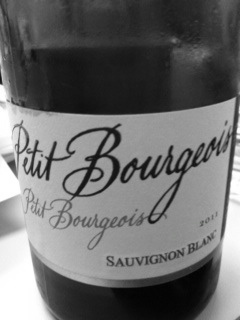 There are moments of excitement and exuberance when I find that same bright, crisp, clean taste in wine, and today was that day with the Petite Bourgeois Sauvignon Blanc. A direct translation from French doesn’t sound like this wine will be the winner it is, but unscrewing the bottle cap (yes, it’s a screw cap not a cork), the freshness of spring and happiness abounds in a simple 750 ml. You will want to embrace middle-classness if this is what that means. A clear, pale gold color Monet would be proud of, the Petit Bourgeois gave off clean, crisp green apple, green grape, dewy slate and grass notes on the nose and palate. The acid was refreshingly medium-high with a long lasting, fruity-minerality flavor that was very well balanced. Light and refreshing, you won’t need to miss a workout if you drink this wine, but you might be having too much fun in the lingering light of the season to put it–and yourself away–too early in the evening. Have another glass–this wine will keep your heart rate up with glee! (I’m even giddy WRITING about the wine). Found in my new favorite wine shop with great staff http://www.crystalcitywineshop.com/, this wine only set me back $14.99 before tax. Viva Crystal City! Viva le Bourgois!